Ultimate Sports Talk – Power play goals rocket BU past Merrimack; Cloonan scores! Power play goals rocket BU past Merrimack; Cloonan scores! Terrier Fan Blog January 21, 2019 Comments Off on Power play goals rocket BU past Merrimack; Cloonan scores! 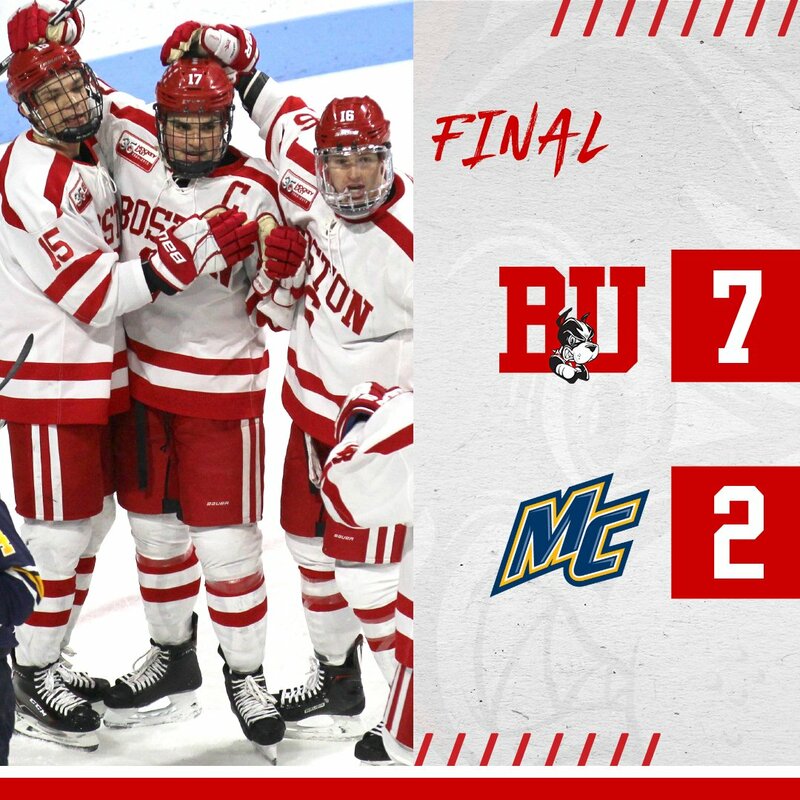 Terrier special teams produced four goals—three on power plays and one shorthanded—as BU thumped Merrimack, 7-2, in a Martin Luther King, Jr., Day matinee at Agganis Arena. Six Terriers had multiple point games including Patrick Harper (1G,2A), David Farrance (2G), Shane Bowers (G,A), Joel Farabee (2A), Dante Fabbro (G,A) and Patrick Curry (2A). Senior Ryan Cloonan, who in recent games set up first career goals for Matthew Quercia and Jack DeBoer, broke a goal-scoring drought that extended back to his freshman season. His tally gave BU its first lead of the game. Merrimack drew first blood at 8:50 of the first period when Chase Gresock took a clean win of a draw and fired a shot from the top of the left circle past a screenedJake Oettinger. Six minutes later with BU on the power play, Farrance connected on a center point slapper with both Curry and Ty Amonte screening Craig Pantano. Harper and Curry picked up assists. In the final minute of the period, after Cam Crotty’s slapshot from the high slot was saved, Cloonan banged the rebound off the left post and then pushed the carom between Pantano’s legs for his first goal of the season and a 2-1 Terrier lead. Shane Bowers also assisted on the goal. BU extended the lead in the middle period, first on Max Willman’s unassisted shorthanded goal at 9:39, and then four minutes later when Harper cleaned up the rebound of Curry’s shot with Amonte picking up an assist. Just 20 seconds later, Logan Drevitch’s breakaway goal narrowed the lead to 4-2. Terriers would tack on three more tallies in the third. At 2:02 co-captain Fabbro blistered home a shot from the left circle for BU’s second power play goal, assisted by Chad Krys and Farabee. Four minutes later with BU on another man advantage, Farabee beat a defender to the puck behind the net and sent it into the crease where Bowers knifed it home. BU closed out the scoring at 10:25 when Harper found Farrance skating to the left circle where he fired the puck past Pantano glove side. Kasper Kotkansalo had the other assist. Oettinger stopped 30 Warrior shots and, while playing with the lead most of the game, the junior netminder made several highlight reel goals in the final period. With 2:30 left in the period, he was relieved by Vinnie Purpura, making his Terrier debut after joining the team earlier this month. Willman’s shorthanded goal was BU’s seventh of the season. BU enjoyed a dominant game in the faceoff circle, winning 36 of 55 draws. With the win, BU is 5-1-1 in its last seven games. Former BU head coach David Quinn, in Boston for yesterday’s Bruins-Rangers game, was in attendance at Agganis. 2019 recruit Robert Mastrosimone scored a game-tying power play goal leading to Chicago’s 4-3 overtime win against the NTDP U17s. 2002 recruit Luke Tuch scored his ninth goal for Team USA. Charlie Coyle’s third-period goal was the game-winner in Minnesota’s 4-2 win against Las Vegas. Jordan Greenway contributed an assist for the Wild. Nick Bonino scored his fourth goal in four games—and the 100th of his pro career—and added an assist in Nashville’s 4-1 win against Colorado. For the first time this season BU is ranked in the top 10 of the USCHO weekly poll. Terriers are 10-2-1 in their last 13 games, including sweeps of ranked conference opponents BC and Providence. Next up for BU is a home-and-home against Merrimack.